Submitted by Norm Roulet on Wed, 09/20/2006 - 22:08. As I looked through the locked door of the Edgewater Deli, a few hours after Salim Alsoliman, 54, was gunned down there, I thought of the "Andy Warhol - Supernova: Stars, Deaths and Disasters" exhibit I'd seen at the Art Gallery of Ontario, in Toronto, earlier that same afternoon. Andy stated, about his Death and Disaster series of paintings, one of which is detailed above, "I thought it would be nice for these unknown people to be remembered by people who wouldn't otherwise think about them." From the Warhol experience, I realized few people in NEO would think about Mr. Alsoliman's death for more than their 15 seconds of reading or watching the news about this shooting, and even then they would not really think about Mr. Alsoliman... yet there his blood still lay wet on the ground. An article titled "Andy Warhol: Pope of Pop" writes of the Death and Disaster Series: " The heavily manipulated photographs, repeated over and over again, imply through their multiplicity that society is merely a silent witness to everyday horrors and that death, is simply another aspect of life to be reckoned with." The first in the series, titled Tunafish Disaster, 1963, described and detailed below, has unique significance today, as an Ohio child apparently just died of eating contaminated organic spinach. Produced in the same way and subjected to the same Warholian aesthetic treatment, this particular series of paintings, set alongside his depictions of consumer items can perhaps be viewed as a continuation of a theme, dramatically illustrating a breach of faith in the products of the industrial revolution by featuring consumer products that bring about death in the car-crashes and perhaps more poignantly in the Tuna-fish Disaster paintings which demonstrate the dark side of the Campbell's Soup Cans. Yet set apart, these paintings on their own tell a story or two. This is death of the little man, the violence of which perhaps allocates him "fifteen minutes of fame" in the media attention he has received, albeit in such fatal circumstances. The press photographs that Warhol chose to transfer on to canvas all retain the narrative conventions inherent to photo-journalism. The images of suicides, car-crashes, race-riots, a burn-victim's rescue and an atomic bomb explosion all explicitly depict occurances set within the unromanticised context of real-life. The force of the original narrative in these works transgresses the mediations of Warhol's visual style. As his subject escalates in intensity, Warhol's style becomes increasingly transparent. Seeing the Warhol exhibit had a profound impact on me, as I thought of the human experience in American society today, how far people are isolated from brutal reality, and how easily people ignore tragedy as a result. While we are bombarded by fantasized depictions of death and mayhem in fictionalized media, real life media does not expose people to the brutality of man against man. We do not see the blood and pain caused by the drunk drivers who daily kill innocent people, and so are not outraged enough. We do not see the pain of the homeless and so are not outraged enough. We do not see the blood of murder victims and so are not outraged enough. And we do not see the mayhem of war and so are not outraged enough by that. 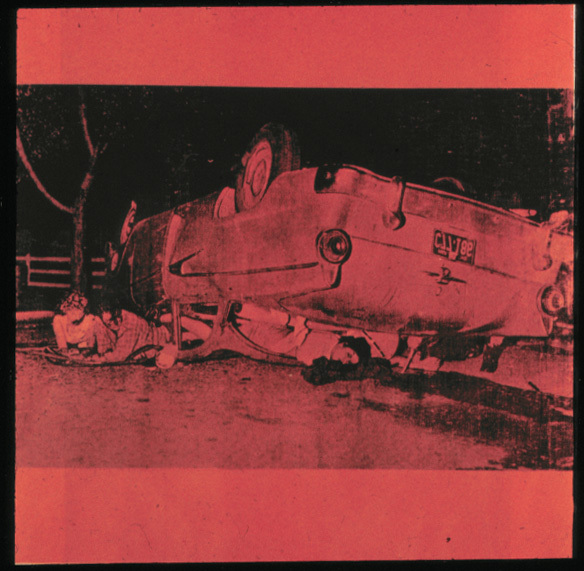 Andy Warhol's Death and Disaster series disturbed viewers in 1963, and would disturb viewers now, if people were exposed to such honesty today. I believe people being disturbed by the problems in society is part of solving our problems with society - we must convert people from viewers of entertaining 15 second sound-clips to where they observe, experience and care about things that truly matter, as part of their everyday lives, at least for 15 minutes, here and there. We have not yet caught the killers of Salim Alsoliman, and the media is not telling us the victim's life story or making us care about him or his murder at all. So we will not be surprised by the next murder, or drunk-driving killer, or war, as they are all just a series of desensitized 15 second soundbites... entertainment in this post-pop surreal time of the second coming of a Norman Rockwell America of dreamy dreams. 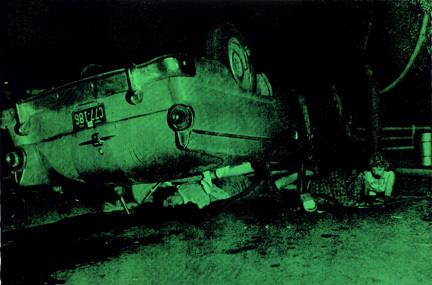 For a healthy dose of reality, make a quick trip to Toronto and see Warhol's death and disasters, and then think of ours. Submitted by Norm Roulet on Fri, 11/13/2009 - 01:08. I just noticed this posting is an the popular list today. In thinking about the purpose and value of REALNEO, consider this posting from a little over three years and 6666 reads ago still impacts people greatly today. It seems especially timely these days. Submitted by Eternity on Fri, 11/13/2009 - 16:47. Voyeuristic disaster and the horror of excess and glamour, Andy Warhol understood this well. Warhol personally experienced the pain of alienation and was sensitive to nightmarish horror that seems to touch all our lives at some time, one way or another. Which is why I think it's such a terrible injustice that his version of Pop Art has been replaced with the Jeff Koons kind...over-the-top fluff--trinkets on steriods. Koons is cool and all, and I do like his work, but he's anything but Warhol. Andy spoke the language of social consciousness--veiled in pantone technocolor or grainy black and white--being not afraid to challenge accepted mind-sets of the day in a way that induce involuntary self-reflection. Warhol made the ugly pretty, or at least tolerable to look at, without diminishing its akwardness, blandness, tragedy or pain. Submitted by lmcshane on Fri, 12/28/2012 - 00:12. Good bye. Sorry that this FREE site where you can post content and be seen by millions doesn't live up to your perfect standards. There are important things to post. Not everyone can make this their life. Thanks for the posts and time you did spend here. Too bad it will die with your bad mood. Submitted by lmcshane on Tue, 04/24/2012 - 07:14. The horror of brutal violence took the lives of my neighbors yesterday. Most likely, murdered by a family member. The family has seen their share of tragedy. The father has not been well and it was a full-time job for the mother and daughter and granddaughter to care for the father. Through it all--the family depended on the strength of the matriarch. And, now she is gone.